The group focuses on extending the boundaries of 3D additive nano-manufacturing for the bottom-up fabrication of functional semiconductor nanostructures in solution. 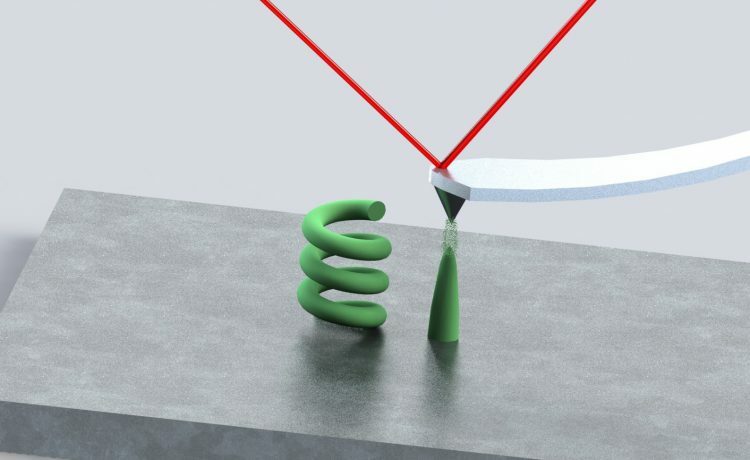 We expect that the flexibility and low-cost of the fabrication method will open up a new range of possibilities for the generation of novel device geometries in the domain of photonics and energy conversion. In particular, III-V semiconductors, such as GaAs, have shown best solar energy conversion efficiencies so far in single junction and tandem devices. However, one of their main disadvantages is the large material and fabrication costs. In this sense, our aim is to develop and exploit a bottom-up synthesis method of inorganic III-V 3D-nanostructures towards the fabrication of efficient low cost energy conversion devices. Our approach is based on confined electrochemical deposition through a scanning probe nanoelectrode. In order to ensure a rapid successful development of the technique, we have engaged a relationship with the Bruker company to cooperatively develop the application tool for nanoelectrochemicalgrowth with their atomic force microscopes. This will result in a powerful platform offering new grounds to current additive nanomanufacturing tools with the potential to a sheet-to-sheet fabrication by using multielectrode arrays. The flexibility and low-cost of the fabrication method will open a new range of possibilities for the generation of novel devices, in particular in the domain of photonics and energy conversion. As a first task, we are currently working on assessing the limits of the nano-deposition technique in all 3 dimensions via the deposition of one-element metallic structures.